I’m not sure I can adequately express how dear my boyfriend Carson is. He is a man of many talents – firefighter, beekeeper, farmer, animal expert, champion cuddler – but I often fail to understand how his clock ticks. Here’s a prize example. This fall and winter he spent months drying two full grocery bags full of walnuts he collected from obliging trees (walnut trees are like weeds around here), and then days – nay, WEEKS – shelling them. The result? 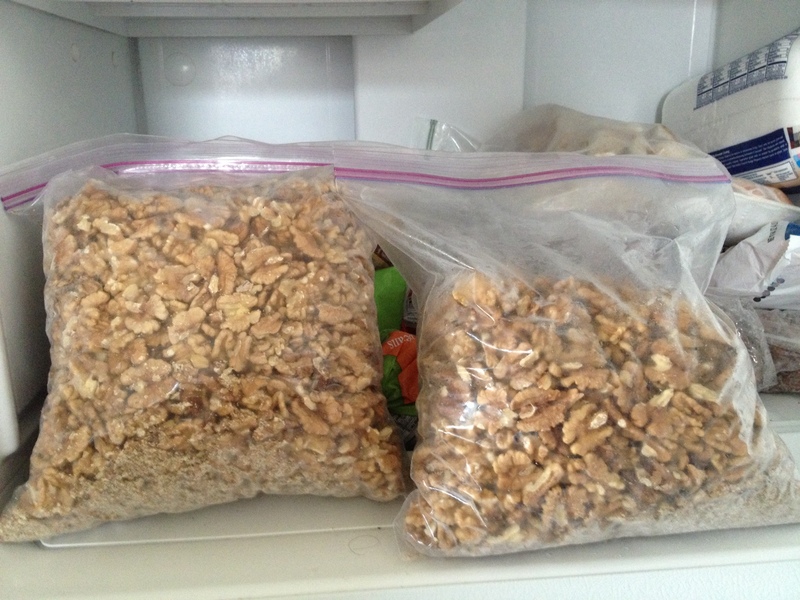 Two gallon-size bags of walnuts in our freezer. So far I’ve used them in salads and many batches of gluten-free banana muffins. The other day I thought I’d make a treat and baked a big batch of chocolate walnut brownies, using real flour. “There’s a surprise for you when you get home,” I texted him. “What’s my surprise?” he asked as he walked in the door several hours later. “I made brownies,” I said as I enthusiastically held up the tray for him to take one. And they were good. If you’re in the mood for a simple brownie I doubled this recipe, but I used 6 eggs instead of 8, and 1 cup butter instead of 1 1/2. This entry was posted in Love, Recipes. Bookmark the permalink. Hhahahaha! This cracked me up. But, no, really, why did he shell them? I have no idea!! I still can’t get a straight answer out of him on that one.